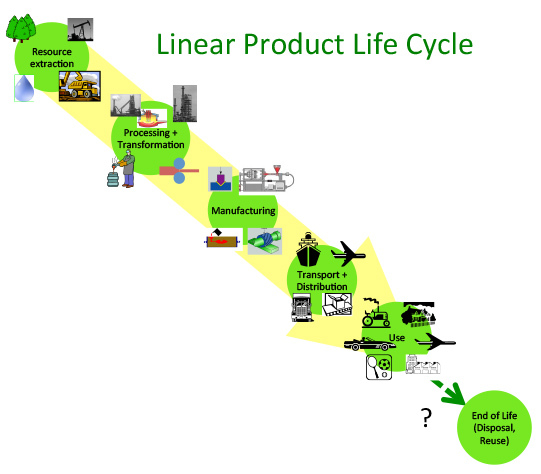 The “circular view” of the economy is in contrast to the “linear view.” In a post earlier this year the concept of the circular economy was introduced with an illustration of the desired paths of material use in an ideal economy, the “technical materials cycle”, as a parallel to the biological materials cycle. 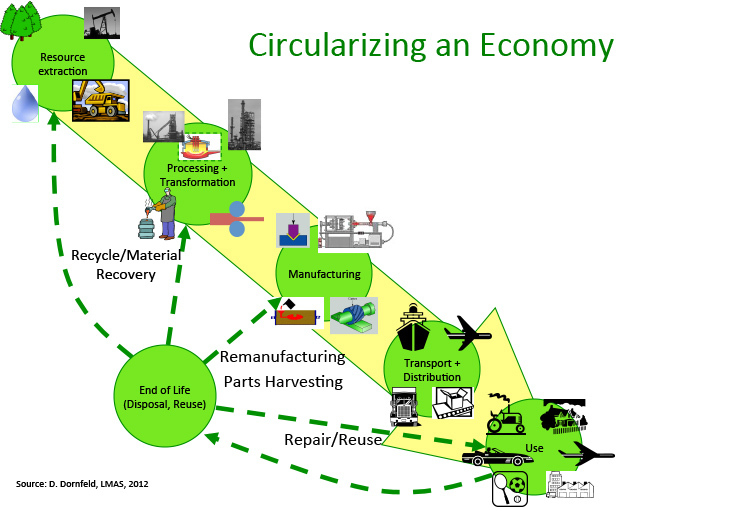 Let’s review the concept of circularity in the economy so we are all on the same page! According to the Ellen MacArthur Foundation (EMF) the current “linear” economy (meaning basically take + make + dispose) is based on large quantities of cheap, easily available energy, water and materials. That model is rapidly reading its limits as materials, water and (to some extent) energy become more inaccessible or, at least, costly to obtain. We might expand the take + make + dispose to something a bit more complicated as take + process + make + distribute + and dispose … but it’s the same idea. The figure below gives a more detailed picture of the product life cycle in our linear economy. To accomplish this it is necessary to “circularize” the linear image above as below by including return loops (ala the Ricoh Comet Circle) for such things as product repair and reuse, parts harvesting, remanufacturing and redistribution, materials recovery and reprocessing, and recycling. So how is this to be accomplished? Not surprisingly (at least not surprising if you’ve been reading this blog for any time) manufacturing plays a large, and to many, key role. Let’s take a look at the right side of the butterfly diagram and look more closely at the circles and intersections. The figure below (from Rachel Dzombak, Adapted from Philips 2015 & Ellen MacArthur Foundation 2012)is a schematic of this “right side” and parallels the prior diagram with some additional specificity in where circular paths connect and showing circularity and “leakage”. Add to that keeping track of “where this stuff came from” and insuring this is being done in an environmentally benign way (not to mention with energy and water and other resource efficiency) and this is a major undertaking. But … that sounds a lot like manufacturing! To make everything go “round and round” by extracting stuff from the life cycle and reinserting it in a useful manner back in is dependent on manufacturing in all its glory. And automation can play its role to insure this is productive but this is going to require a rethinking of “the system” and a recalibration of the business model so that the capacity and flow are large enough to insure this is economically viable. Let’s talk more about that next posting. Finally, LMAS researchers along with others in the Center for Green Chemistry at Berkeley will be participating in the Disruptive Innovation Festival (DIF) hosted by the Ellen MacArthur Foundation with our own Berkeley "Big Top Tent". It will take place over three weeks in November with some live, some pre-recorded, sessions on a variety of topics but all available through the DIF link for some time after November for people to watch and review. We'll be presenting on the topic of "The Role of Manufacturing in the Circular Economy" with more detail following the above discussion. You can follow the link to DIF to register (free!) to view all the program contents. The LMAS presentation will "go live" at 18:00 - 18:30 GMT on the 19th November. I recently bought and read a book “The Second Machine Age” by two visionary authors at MIT predicting (touting?) the rise of the next industrial revolution and the age of the robots … like the phrase in Lord of the Rings movie predicting the demise of men (“The Age of Men is over. The Time of the Orc has come." — Gothmog to his army in The Lord of the Rings: The Return of the King). We see here the rise of the machine (again). The benefits are clear for the economy on the front side … the challenges created by the “if your job was eliminated” part are less clear. First of all, I am not a luddite. I love technology and have spent a lot of time researching and developing aids to automation that make factories and machines hum and perform efficient, quality, cost effective operations. And, I also am aware that many times in the past (just check Amazon for this Second Machine Age book and they’ll give a list of a bunch of earlier books predicting the machine age and its benefits others have bought) there have been similar predictions but calibrated to the buzz word of technology of the time. Recall a post in this blog back in October 2014 on the digital revolution where referenced was made to a Fortune article from November 1994. That article predicted that the digital factory could have the effect to “stabilize or even increase the number of production-worker jobs in the U.S.” Well … not so much in the U.S. Maybe elsewhere. But, there is a growing concern about this enthusiasm for the age of the machine - at least among some of us - or at least by me. Part of the concern stems from the simple question “Who takes things apart?” The last posting on the circular economy summarized the results of a study on material flow in the economy as follows: “… the degree of circularity of the global economy measured as the share of actually recycled materials in total processed materials is quite low - only 6%. Most of the processed materials (66%) left the global economy as wastes and emissions.” This is a problem and it is not necessarily helped by automation or increases in efficiencies on the “input side” of the economy. Let’s look more at this. way to represent the “supply chain” feeding the consumer. The forward (counterclockwise loop) at the top is from materials through production to delivery to the consumer and use. 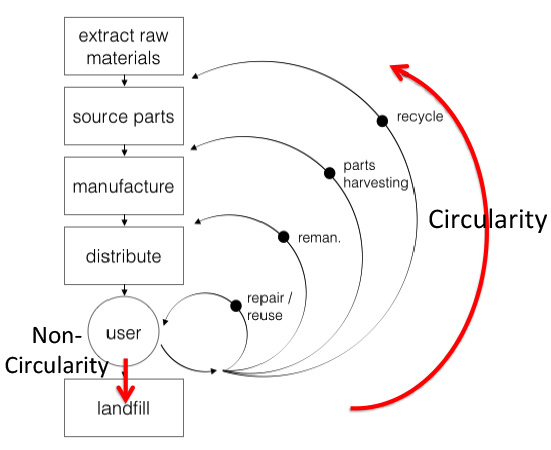 The reverse (clockwise loop at the bottom) is after the consumer is done with the product back through recycling, recovery, and return to material supply chain. Usually when a green supply chain is mentioned it is in the context of the return loop - resource recovery. The posting noted that the forward loop is only half the battle and, if that loop is done correctly, the reverse loop is much easier to implement and overall better. “Better” here refers to design for everything necessary to make the product successful and efficiently producible, energy efficient in use, etc., but, also, adaptable to the reverse supply chain. This is the circular economy! The reverse loops in the comet circle are the return loops in the butterfly diagram on the technical side of the circular economy. Automation with its robots, assembly systems, mechanized manipulators and tooling put things together. And usually in a way that they stay together. They they don’t take things apart. If you Google “robotic disassembly” one of the top hits is a 2013 posting in Popular Science on “How it Works: The Robotic Chicken Butcher”. Elon Musk refers to the recent explosion of one of his booster rockets as “rapid unscheduled disassembly.” That’s not what we are talking about! OK - I know there are other examples of robotic disassembly - some hardware is available but the field of technology applied to disassembly - for the purpose of repair, remanufacturing, reuse, recovery or recycling - is not at all developed. So how do we move up from 6% circularity? How about people? What if the design and production of products was done in consideration of the return loop in the comet circle? What if we could take apart for the purpose of remanufacturing (essentially extending the life), repair, reuse, etc. the products that course through the veins of the industrialized economy? And do this for everything - from cell phones to dishwashers to automobiles to airplanes and buildings. That would be a big step forward. Some are already working on this. A company named CoreCentric Solutions in Chicago focuses on what is called “reverse logistics supply chains” - part lifecycle management and remanufacturing solutions. They work with large and small companies to take excess inventory back, take back for part recovery and reuse out of date or replaced products, remanufacturing, etc. Their website says “Often times parts removed from an appliance after a service call are thrown away. This creates unnecessary waste in our landfills. Recycling appliance parts in a proper manner helps to "go green" by keeping harmful chemicals and metals out of land, water and air.” Then another section of their website is a shopping area where they offer “quality remanufactured” parts for the major appliances among other products. I have not been to their facilities but I would be surprised if they were highly automated. That’s the challenge! How could you scale such an operation to handle the reverse logistic loops of the circular economy? Any attempts at “disassembly” that have been published have been for a narrow set of products with very specific characteristics (modular, take apart/disassemble from one axis motion, removable fasteners/not welded/glued/riveted together, and so on). These are not usually the characteristics of most products produced today - think cell phones, consumer electronics, wash machines, or automobiles. But these are manufactured with high degree of automation. So, what’s the solution? What if one used less automation to assemble and produce products (but still could use tools and methods to make production efficient) so that one could more easily take these apart for the purpose of remanufacturing, repair, reuse, recovery, recycling? But, we’d need to see the numbers! We’d need to do a reasonable comparison of any “losses” due to reduced efficiency on the input supply side of the Comet circle (assuming there are some … not necessarily true if done right!) and how those would be offset or balanced by gains on the output return supply side. And, for automation, one might add to this design for assembly from “one direction” … the “stack assembly” element listed above. If one reviews the list, several guidelines pop up that, while making assembly efficient (and hence the supply side chain productive), in fact may frustrate the return loop in the comet circle for disassembly. For example, minimizing part counts encourages the use of parts with many materials or elements integrated as one … making replacement of pieces or recovery of materials challenging. Using self-fastening parts means things need to be mechanically or thermally separated rather than just the removal of a fastener. This is even more challenging if adhesives or welding/bonding (non removable fastening) are used. The good news is that most guidelines for robotic assembly should lend the product to easier disassembly. Parts need to be easy to grip (the facilitate parts handling element above), directions of assembly (stacking) as above accommodates the less dexterous movements of robots compared to humans. So, there is a basis for accommodating both assembly and disassembly. The real challenges come from “how things are held together” - what engineers refer to as fastening technology. 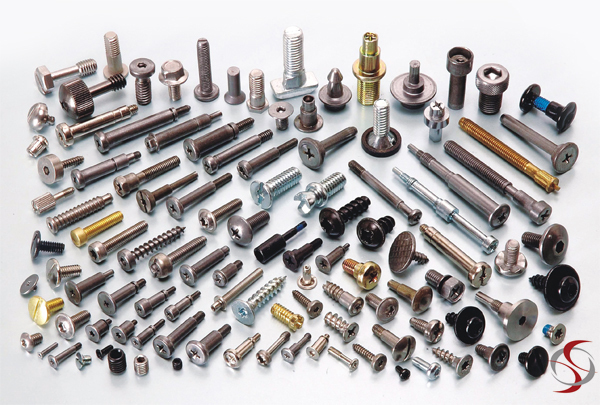 This ranges from screws, to nuts and bolts, to rivets to crimping, adhesives, epoxies, welding, soldering. These are meant (at the weld, solder, adhesive end) to be one time no return joining processes. 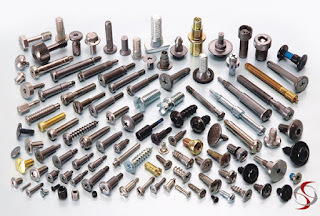 The image below of one small set of the fastener world illustrates the challenges of accommodating only one type of removable fastener. Rivets are close but can often be removed by a simple drilling process. If one follows all the rules of design for assembly and then creates one giant monolithic block of product with integrated materials and essentially unassemblable components we have a problem. Take a look at most of the consumer products around your home or work place - you’ll see what is referred to- designed to be put together and work … and then disposed of, not disassembled. Finally, all parts flowing together in a symphony of assembly are known as to type, location, etc. Robots require exact location, orientation, delivery, etc. to support automatic assembly. When things get taken apart it is easy to lose the orientation, part knowledge, etc. So, to facilitate reuse or remanufacturing it would be necessary to provide labels or marking on parts to keep track of them for future use or recycling. But this is, like most of the topics discussed in this blog, an engineering problem - even a manufacturing engineering problem. And, the role of humans in the reverse logistics loop must be considered. The flexibility of humans which was so important to “work around” in the forward loop to insure maximum automation might be just the ticket for the reverse logistics loop. But this would have to be teamed with designed tooling and systems to insure the reverse loop is just as productive as the forward loop. So, if you get your pink slip from the assembly side because a robot stole your job take your application to the reverse logistics side … they should be hiring! The last posting on the circular economy (CE) was back in August, 2014 and discussed how to measure progress and the role of big data. The focus was on more sustainable behavior and how we might encourage consumers to consider sustainable products. 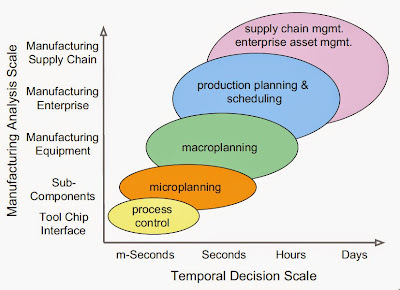 In that context manufacturing needed to increase the yield (efficiency of conversion of materials in to products) in a number of processing operations by identifying “insights” into production that were overlooked due to complexity of the process, large numbers of variables, many differing process stages, etc. And the use of “big data” was one solution. 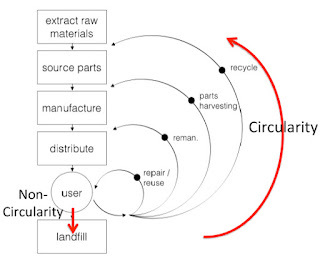 The circular economy idea, as introduced in part 1 of the posting on the subject strives to convert our current “linear economy” (paraphrased as “take, make, dispose) where we convert resources into products, use them until they wear out, break or become out of style, and then discard them, to a circular economy. According to a recent EU report, a circular economy is one where-in systems retain the added value in products for as long as possible and eliminate waste. In addition, resources are kept within the economy when a product has reached the end of its life, so that the product can be productively used again and again and hence create further value. (Source: “Towards a circular economy: A zero waste programme for Europe,” Communication from the Commission to the European Parliament, The Council, The European Economic and Social Committee and the Committee of the Regions, COM(2014) 398). If we think of our planet as a closed system (sort of like a space station floating in the ether) then nothing is really created beyond what we have already available in nature and nothing really disappears as there is “no where for it to go!” So if we look at the extraction of minerals and other raw materials, their conversion into products and use, and then their end of life (usually disposal), the “circularity” relates to the reuse of materials and resources so that we keep within the limits of their availability for all time. Once materials are extracted from the environment and subsequently converted into something our “system” (referred to below as the socioeconomic system (SES)) uses them or stores them and eventually outputs or disposes of them. In one sense circularity measures the degree to which once materials are used they find their way back into the system for productive use. This is complicated. Some materials, as in buildings, stay “in the system” for a long time before being expelled. Others, like cell phones, may be substantially shorter lived. Within the system we can recover and reuse, or extend the life of, products containing these materials and, hence, enhance circularity. Or we can expel them as waste. The objective in this post is to explore what our current state of circularity is with respect to materials. - The linear economy externalizes costs in search of production cost reduction whereas the circular economy internalizes costs in search for quality service/performance and low risks. - Linear point of sale ends responsibility while circular considers business responsibility extends beyond point of sale and includes rent/lease/recovery. - Linear creates waste streams for municipalities and individuals/society to deal with and circular reduces waste streams and creates value streams instead. - Linear encourages standardization to add to efficiency and ease of consumption while circular encourages standardization of components and protocols to encourage repair, recovery and reuse. - In linear economy prices reflect only the private costs of production, distribution, sales, etc. while in circular prices reflect the full costs aided by reduction of externalized costs. - Linear taxes labor which encourages labor productivity by substituting capital or energy while circular taxes waste, non-renewables, and unearned income. - The linear economy views recycling as another flow of raw material and overlooks the lost embedded energy and quality. - Linear economy transforms natural and social capital into financial capital using short term preferences with a preference to rapid, large flows while circular (re)builds capital (stocks) from which to derive more and better flows over the long term. These, plus the rest of the 15 characteristics, define how the elements of the circular economy link back into the system. 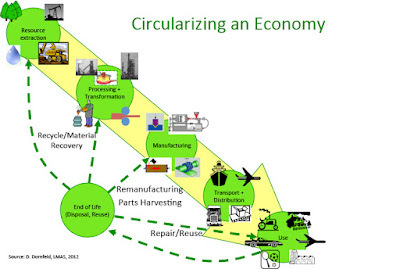 Recall the “butterfly” diagram from the earlier posting on the circular economy. It is a mirror image with the “biological materials” on the left side showing the return material stream in a biological system and the “technical materials” on the right side also showing the links back in the system. The diagram shows parts manufacturers, product manufacturers, service providers, consumer/users, collection and then energy recover and landfill. The links are designed to reduce the “leakage” (loss of materials, energy and labor - expelled from the system) to disposal and landfill buy re-introducing materials back into the system as appropriate. The ideal situation is when products are extended in their use by increasing lifetime, remanufacturing or refurbishing. One big question is: what are the material flows and waste production and recycling - meaning “how circular is the global economy?” It is important to determine the current state of circularity so that one can have a benchmark against which to track improvements or see the effect of individual or collective efforts. Interestingly, this is the title of a paper published in the Journal of Industrial Ecology in March 2015 by Willi Haas and colleagues (full title: How Circular is the Global Economy? : An Assessment of Material Flows, Waste Production, and Recycling in the European Union and the World in 2005; DOI: 10.1111/jiec.12244). 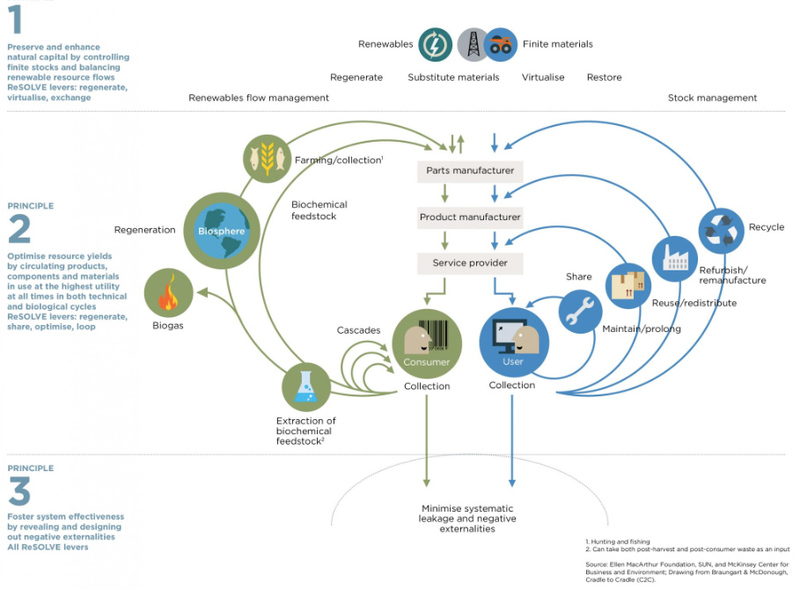 The paper points out some different strategies for advancing circularity. Loops can be closed through recycling and reuse first. Then one can include shifting from fossil to renewable energy energy sources and converting efficiency gains into reducing the overall level of resource consumption. Recycling is very advanced in some sectors, like metals, but energy requirements for recycling can be high and lower quality or contamination of recycled materials can lead to down-cycling or increased use of virgin material use or drive development of lower quality products. 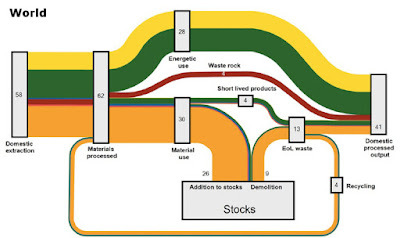 But the main thrust of the paper is to layout the flow of materials in the world with a view to determining current levels of “circularity.” A simple model of the economy-wide material flows (from resource inputs imports and extraction to outputs of wastes and emissions and exports) and the different flows and processes quantified in the study is shown in the figure below. In the figure EoL waste = end-of-life waste; DPO = domestic processed output. Here PM’s are domestically processed materials as the sum of apparent domestic consumption of materials (DMCs); extraction plus imports minus exports and recycled materials. Then, following this set of indicators, the authors prepared a Sankey diagram of material flows through the global (world) economy, below. Details of the data that make up the chart are in the paper. You may have to click on the figure to see all the detail. The authors state that the degree of circularity of the global economy measured as the share of actually recycled materials in total processed materials is quite low - only 6%. Most of the processed materials (66%) left the global economy as wastes and emissions and a large fraction (27%) were net additions to stocks of buildings, infrastructures, and other goods and products with long life spans. the material embodied in these products will enter the recycling stream only after significants periods of time. They note that materials used for energy generation dominate the inputs (44% of all processed materials). Although only 6% of all materials processed by the global economy are recycled and contribute to closing the loop, if all biomass is considered a circular flow regardless of production conditions, the degree of circularity increases to 37%. Two important observations can be made. First, there is a tremendous “accumulation” of materials due to in-use stock (from buildings to automobiles to appliances.) This is of course increasing as affluence increases overall accompanied by increased consumption and pollution increase (remember the IPAT equation?!). Thus, the system is bulking up on materials. If we consider the large amount of materials used for energy generation, closing the loop is not possible. That will keep the degree of circularity for those materials low. Here’s where manufacturing comes in! The statement “reducing the barriers for recycling” includes manufacturing products to allow them to be disassembled, materials extracted in as clean a state as possible and reused. Design is of course important but it is the synergy between design and manufacturing that enable this. Modularization, another challenge addressed by manufacturing technology, aids product longevity. And, more efficiently using materials, converting them into products (improved yield at a minimum) will allow provision of the same product service with lower material requirements. That will help reduce the amount of "bulking up" - whether in construction, consumer products or others. Approaches to the manufacturing challenges reviewed in the last paragraph have been mentioned in earlier postings. Manufacturing (in the broadest sense) is one of the key drivers (if not the key) to enabling a circular economy. China became the world’s biggest greenhouse gas emitter in 2006 overtaking the US due primarily to electricity generation and industrial processes. However the per capita carbon footprint of a Chinese person is still much lower than the average US person. This is not good. Increasing industrialization and the slippery slope to more consumption. So, what’s the hole and how do we stop digging?! Michael Oppenheimer, a Princeton University climate scientist, recently commented on a public radio talk program broadcast on KQED in the San Francisco Bay Area (Michael Krasny’s Forum program) about the recent release at the end of last year by the United Nations of one of its bluntest and bleakest reports to date on the dangers of global warming. The UN study, prepared by he Intergovernmental Panel on Climate Change (IPCC) warns that the world must cut nearly all greenhouse gas emissions by 2100 in order to head off the worst effects of climate change. U.N. Secretary General Ban Ki-moon urged world leaders to act, saying that “the science is unambiguous”. The IPCC study now argues that humans are affecting the climate with 95% certainty (this is the same degree of certainty with which the medical community links smoking to lung cancer … there is always a possibility that it is not the case but the preponderance of evidence indicates there is a cause-effect relationship). 3 Options for adaptation and mitigation. This view (and statements like the one above) has come under fire … specially in the US … where for some odd reason there is a movement against education, logical scientific thought and reason, in favor of the opinions that might be politely characterized as “less informed.” It’s not clear why that is. Everyone has a right to their own opinion, of course, but consideration should be given to facts and reality in coming to it, or one would think. Maybe the truth is hard to face, harder to accept and plan for and harder still to accept that there are others that may know more about a subject than we do. Education used to help with this. But, many of the same anti-science (or at least anti-this science) folks also are not big supporters of education. So it goes. Two things it would be good to remind ourselves of … 1) there is value in scientific expertise, properly and transparently carried out and 2) humans will always want to improve their status/affluence. People say manufacturing productivity will save the day but labor productivity misses the point. We really need to think in terms of resource productivity. You may recall that we had this discussion in a posting in July 2013 as part of a discussion about the effective utilization of resources and how resource productivity, rather than labor productivity, might play into the argument (http://green-manufacturing.blogspot.fr/2013_07_01_archive.html) This discussion included again a reference to the IPAT equation (and the attention given to the “T” part - impact per unit of GDP or the so-called technology term) and need to increase by factor of 10 this “productivity” to offset the growth of population and affluence. the consumption of energy and the growth in standard of living (as represented by GDP/capita). As countries become more affluent their energy use grows. This is due to a couple of contributing elements - for example, acquisition and use of more and more products that use energy and other resources (think refrigerators, automobiles, televisions, plumbing, etc. ), transition from agricultural based economies to industrially based economies and the generation of electricity to power all of this. That’s digging the hole faster. How do we stop digging or, at least, slow down the rate of digging until we can stop? One solution lies in the slope and amplitude of the above curve (meaning how fast it is rising and to what level does it eventually get?). We can see from the above figure that the US is already there, and higher, than any of our competitors. But others, developing (or emerging countries) are determined to climb the affluence path. And we cannot really stop them. But, is there any reason that the link between a certain level of affluence (as represented by GDP/capita) and the energy consumption to get to that level is fixed? It is if we think in the same way of resourcing, making, distributing and disposing of products. If every country that is working to increase the affluence of its inhabitants follows the lead of those that have gone before we are stuck (still in the hole). But why should they? The real question is how do we serve this inherent need but more effectively and not at the expense of the world - how do we stop digging? If we can find a way to resource, make, distribute and, instead of disposing of products, extend, rebuild or re-use products wouldn’t that be better? And, if we can do this while maintaining (or increasing) the value of the product in the eyes of the market or the consumer wouldn’t that be one way to address the “T” in the IPAT? Meaning, driving the impact per unit of value (or GDP) lower. But there’s more! How can we implement these novel manufacturing impact reducing ideas not just in the countries that are already way up the curve (or “developed”) but those that are climbing? We should be able to implement production technology in emerging economies as well so they don’t have to create all the challenges we have first. This will be the topic of a future posting since, obviously, the technology must match the situation. Wouldn’t this be better than just betting on productivity, traditionally measured, to save the day? Isn’t betting on productivity sort of like saying the solution is digging faster? In fact, our friends at McKinsey are already worried about this. In a recent, January 2015 MGI report they ask the question with respect to global growth - can productivity save the day in an aging world? The manufacturing strategies mentioned above to reduce impact per unit of GDP will not work for service industries - a large part of the McKinsey study and many economies - but a more enlightened view of productivity, meaning resource productivity, will help drive these technologies for both emerging and developed economies alike. So, not only will we stop digging … we’ll throw away the shovel! What is “your butterfly” up to?! Past postings have included discussions of the Ricoh Comet Circle and the circular economy as reasonable representations of several (perhaps oddly) connected elements in a more holistic view of sustainable systems as they influence green manufacturing. Connections in the context of those discussions have been about “material” interactions and movement … what comes from where, what goes where, where is “away” when something is thrown away at its end of life? Over the new year break a number of discussions came to light about the other side of the “circular economy” coin … influence and effects beyond processes, materials, transportation, energy, water and so on. This needs some explanation. What is referred to here is the influence decisions make on other decisions, people, experiences, quality of life, etc. Behind the smooth interconnectedness of our global economy sits a complex infrastructure of people, places, things. Sometimes these are simply referred to as “the supply chain.” But it’s not that simple. More importantly, if it was that simple we’d not be addressing core values of the many actors in the supply chain. Data, specially that collected at different speeds and representing different “views” of the enterprise from top to bottom as discussed in the last posting, is currently focused on these material interactions and movements. As referred to in the previous blog posting on the digital revolution, communication speeds, computational capability and speed and the hardware spitting out the data from machines and systems are more common, less expensive and more reliable. But, do they tell us the whole story? Or, more significantly, what would be need (or how would we analyze this data and use it) to tell the rest of the story. This definitely needs some elaboration! Let’s rely on an old analogy … the “butterfly effect.” One can find lots about this on the web but, basically, according to WiseGEEK “the butterfly effect is a term used in chaos theory to describe how small changes to a seemingly unrelated thing or condition (also known as an initial condition) can affect large, complex systems. The term comes from the suggestion that the flapping of a butterfly's wings in South America could affect the weather in Texas, meaning that the tiniest influence on one part of a system can have a huge effect on another part. Taken more broadly, the butterfly effect is a way of describing how, unless all factors can be accounted for, large systems like the weather remain impossible to predict with total accuracy because there are too many unknown variables to track.” The site goes on to comment on the fact that there are skeptics that this really works (due, for example, to things in large systems that tend to dampen, or attenuate, effects) but they do argue that is is applicable to complex systems beyond the weather. So, assuming here that the economy (circular or otherwise) or at least the manufacturing enterprise is less than or on the same order of complexity as the weather … and that we believe that small things or changes can affect large, complex systems, can we apply this to our discussion of green and sustainable systems? More specifically, can we refer to any such changes in terms of our interest in influences and effects? OK … let’s go with this for a bit to see where it takes us! What are some of the butterflies that are at play here? How could human effects or behavior in, say South America, or China, or India, eventually have a huge effect on another part? The most obvious answers to this in the context of sustainability start with terms like “conflict minerals” and, then, slavery. Meaning, the "human behavior" affected by slavery, in this case undesired. One of the major human effects (butterflies) that is increasingly brought up is the derivation of work related to supply, handling and production of materials, products or components, specially within the supply chain, from persons not paid, or lowly paid, or otherwise captive by a system that exploits them for labor and other services. According to Free the Slaves there are tens of millions of people in slavery today. They put estimates at from 21 to 36 million people worldwide. These people are forced to work without pay, under threat of violence, and they’re unable to walk away. They can be found in brothels, factories, mines, farm fields, restaurants, construction sites and private homes. Slavery is illegal everywhere, but it happens nearly everywhere according to Free the Slaves. Lisa Kristine, a photographer, has an excellent website dramatically documenting this. This is real. Ones first reaction is “certainly I am not benefiting from or engaged in consumption that relies on slavery.” The links to slavery behind the products we buy and use is complex ... but there is a link. The story is told well at websites like Slavery Footprint which will calculate, based on the composition and origin of products one purchases and uses - including many of the most reputable brands in the markets how many slaves work for you. For example, what about the cotton in the t-shirt, or exotic materials in the smart phone or coffee beans in our cup of espresso? or, closer to green manufacturing, the alloying elements in the solder used in electronics production? My number was 27. I have no idea how accurate this is … but it’s not likely to be zero … so this is not good. So, what about butterflies and their effect? If one knows that slaves are contributing to the products they purchase and use due to, say materials (tantalum in a smart phone, cotton in underwear, constituents in food consumed or products (think cosmetics) used - and knowing the source of the materials and any slavery associated - for example from United Nations Labor Organization and its Global Estimate of Forced Labor), and then one finds out what are the brands that are the most prevalent in the use of these materials, and then stops buying and, more importantly, works with others to get more people to become aware how their purchasing behavior supports slavery, and then companies see the publicity or reduction of sales due to this awareness … and … finally, the companies change their purchasing behavior to source ethically … isn’t that a butterfly effect?! Here is one butterfly example - focusing on conflict minerals in the Congo - called “Raise Hope for Congo." Among other helpful information it has a simple description of how the 3Ts—tin, tantalum, tungsten—and gold move from the mines of eastern Congo all the way to your cell phone. These minerals form the basis of some of our most popular technological advances in devices that most people use every day - game consoles, laptop computers, and mobile phones. Further, besides going into tin cans, tin is an essential ingredient of solder for electronic circuit boards. Tungsten has many uses in traditional manufacturing including drill bits and gold is commonly used in electronic components because of its conductivity and lack of corrosion. And, just as evidence that this is a real butterfly … even McKinsey has an essay on the birth of a consumer movement in their “Socially Conscious Consumer” posting! That means this is real! With information (data!) consumers will naturally move from products whose provenance they cannot confirm or for which it is known that slavery is involved in the supply chain AND move to products that can prove they are ethical. But, the problem still exists. So, to make the full effect requires more butterflies! If you are a company with a large consumer base - think Walmart or Marks and Spencer or Proctor and Gamble or your favorite tech products company - this will cause change (or at least concern and then change!) And, if your product relies on some of these minerals or other materials for its functionality it is a strong encouragement to look for both responsible sources or alternative materials. In an earlier posting reference was made to a BCG-MIT Sloan Business School study about business cases for sustainability. The top motivation indicated in a business survey was improved brand reputation … next was increased competitive advantage. Butterflies work! These butterflies could be helped a lot by data. Transparency, linking back to the social impacts, labor practices/slavery, the influences mentioned at the start of this posting, is the key. Big data may help. But, the data most needed is that which is in this case most hard to come by. So, we come back to the question posed at the start of this post … what is “your butterfly” up to? Or, perhaps more correctly stated, can you get some butterflies “fired up”?! There are lots of opportunities. These influences will need to be included in our view of “circular economies.” We will need more and better data to tell us the whole story. Or, if the data is available, a better sense of how we need to analyze this data and use it to tell the rest of the story. Maybe this should be one of our top New Year’s Resolutions. the facility, line or system in the facility, the machines in the line, the tooling on the machines and finally the process on the machine. This image is updated from the first one shown back in 2009. Along the left side of the image are characteristics of data flow and operations. For example, data rates and response rates of the elements at the different levels range from weeks and months at the highest level reflecting long term planning to minutes and hours in the line for organization of production to seconds and minutes in terms of the machine functions operation as in “macro planning” and then milliseconds and microseconds at the tooling process levels. These data rates reflect the speed of changes occurring in some aspect of the element that has importance to the overall functioning of that element and, necessarily, the consumption of resources. The illustration below (from Vijayaraghavan, A. and Dornfeld, D., “Automated Energy Monitoring of Machine Tools,” CIRP Annals, 59, 1, 2010, pp. 21-24) shows this temporal aspect of decisions and impact more clearly. To affect process control at the process level (here for a metal cutting operation - hence the reference to chips and cutting tool) one needs to have data and response at the micro/millisecond rate. As one moves higher in the structure the timing scale slows down proportionally. When reaching the enterprise level where supply chain management and asset management is of concern the decision and response time is longer. This is not, however, to imply that there are not decisions in supply chain management that do not occur more rapidly in some cases. In fact, the interesting thing about this type of representation is to look for the dependencies at lower levels on decisions and responses at higher levels. For example, a catastrophic tool failure at the process level that causes substantial down time and loss of availability of the machine and line could ripple up to the production planning and scheduling level if the disruption is substantial. Each interface between the different levels in the manufacturing enterprise, and their accompanying data rates, decision rates and response rates offers an opportunity to add noise to the system (meaning reducing the reliability of the data or, at least, increasing variability in the data) and must be accounted for. OK … but the Google earth view above has another side to it on the right. 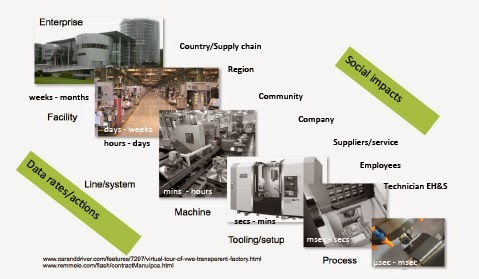 In this figure the potential range of influence and impact of the social effects (or dimensions) of the manufacturing enterprise are illustrated. These are challenging to represent in a simple drawing like this but will affect, at the process level in the facility, mostly the workers and support staff (for example, working conditions, safety, training, pay, etc.). The potential range of impact expands as one moves up the levels culminating with the supply chain which can have a national, regional effect or, within that country, a specific community (for example, air quality, water quality, healthcare and education, etc.). The “data rates” for acquiring impacts for these impacts (assuming one can quantify them sufficiently) will be similar as on the “hardware” side although may not be at the fastest level. Monitoring working conditions for exposure to chemicals or other contaminants for the worker at the machine may need to be done on a second or faster rate. Data on health care or educational levels of workers in the supply chain will be less frequent. Never-the-less, is one desires to apply the digital enterprise concepts to tracking the sustainability of enterprise operations from energy and resources to social concerns the data challenges will be impressive. We need to get more specific. What will this data look like? To illustrate, three examples are presented her derived from recent research at the Laboratory for Manufacturing and Sustainability (LMAS) at Berkeley. They address a facility level view, a line level view and a machine level view. They all concern manufacturing that centers on production of machinery using a range of processes but with a strong component of machining and metals fabrication. Energy consumption is a common metric here as it is readily measurable. Facility level - The first example is drawn from the research of Dr. Nancy Diaz (N. Diaz, “Development of Energy Models for Production Processes and Systems to Inform Environmentally-Benign Decision-Making,” Ph.D. Thesis, University of California, Mechanical Engineering, 2013) and focuses on the comparison of electrical energy intensity (kWh/meter squared/year) for four production facilities of a major Japanese machine tool manufacturer. The data reflects the consumption of energy by the machinery in the plant, the heating, ventilation and air conditioning (HVAC) and lighting. The four plants address different parts of machine tool manufacturing from ballscrew production, the most precise (and hence requiring most exacting control of the environment - temperature and humidity) to less demanding machining and assembly. The figure below, from Diaz thesis, illustrates the dramatic range of consumption of energy per unit of floor area for the different factory functions and energy uses. The ball screw production facility has the highest HVAC energy intensity since these are exceptionally precise components that determine the quality and eventual performance of the machine tool and must be produced under the most stringent environmental conditions. Ball screws are turned by the motors on each linear axis of the machine and cause the table on which the workpiece is mounted during machining to move under the control of the computer program. They define the precision and accuracy of the machine movement (to a great extent). What do we learn from this? First of all, at this level, it is clear what the “relative cost” of different manufacturing processes are in terms of energy (and likely other resources) … precision is the highest due to the requirements of the facility, quality of the consumables, etc. Think of the semiconductor industry as at the high end. Then, it also shows where the greatest potential for improvement is in the process efficiency to reduce this intensity. But, it is also necessary to determine the total impact , meaning, the measured intensity (energy / unit area) times the total area involved in this type of production. If this is a small part of the total production then it might not be the first priority. If it is a major component then it could offer big improvement. Systems/line level - The second example is drawn from the research of Dr. Stefanie Robinson (S. Robinson, "An Environmental and Economic Trade-Off Analysis of Manufacturing Process Chains to Inform Decision Making for Sustainability," Ph.D. Thesis, University of California, Mechanical Engineering, 2013) and focuses on the energy and resource consumption in a process chain with the objective of establishing a basis for trading off the potential for upgrading specific operations in the line. This was based on research conducted with a major heavy equipment manufacturer in the US. 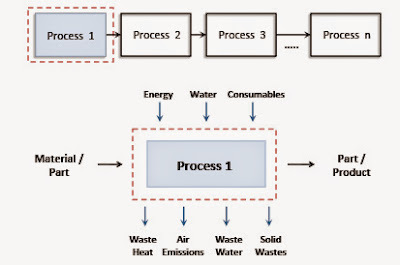 The figure below shows a schematic of a multiple operation process chain and a detail of one of the process operations with typical input and output of energy and other consumables along with waste and emissions. With a representation of a process chain, and the individual operations, one then needs to determine the consumption and rate of outflow of the major consumables and waste streams. One can appreciate that it is necessary to do a rather detailed analysis of the inputs and outputs (wasted and worn tooling, scrap from production, leakages, etc.) to be accurate. With this data, the actual resource consumption and associated economic and environmental cost can be determined. Then, the impact of changes in any of the production steps can be evaluated both in terms of productivity and quality as well as environmental (energy, global warming, water) effects and associated costs as shown below. System consumption metrics and environmental and economic "cost"
Process level - This third and last example bores in more finely on the process level detail for a machining operation. Data from this level of analysis would feed into the systems/line level just described. This example also draws on the work of Dr. Nancy Diaz in the above cited thesis. This work developed a generic method for calculating energy consumption during a realistic machining operation on a precision milling machine based on constant and variable contributions of the material removal rate (MRR). The MRR is a driver of productivity in a machining operation and is based on real time data of the feed rate of the cutting tool, the cutting speed and the depth or width of engagement in the case of milling studied here. This data is now available in real time from the machine controller thanks to standardized interfaces and data formats such as MTConnect and associated software. It is also available from the numerical control program driving the machining operation (that is the path the cutting tool takes in the machining operation) but that is often inaccurate due to actual the performance of the machine in operation. 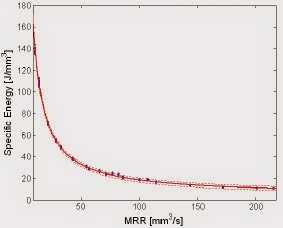 The curve below shows the specific energy (Joules/cubic millimeter, J/mm3) as a function of MRR. The significance of this data is that the designer or production engineer can determine the energy to create a part feature from knowledge (either estimated from the tool path or measured in process). And, this was determined for a variety of machining conditions with different tooling - so it has some breadth of application. For other materials, however, the curve would likely shift up (if a more challenging material to machine - more energy per unit of material removed) or down (if easier to machine). So this is all driven by data! Lot’s of it collected at different speeds and representing different “views” of the enterprise. It is encouraging but humbling. Fortunately, as referred to in the previous blog posting on the digital revolution, communication speeds, computational capability and speed and the hardware spitting out the data from machines and systems are more common, less expensive and more reliable. The expression “drinking from a firehose” comes to mind! But, the good news is that no one will be thirsty! Some of the tools for using this data in productive and green operations will be covered in the future. Dejå vu all over again?! The last posting started the buildup to using data (from where ever) to drive innovation, clarity and transparency, business model/economics, institutionalization, and benchmarking for industry in general and, ideally, for green manufacturing as well. This data should include information on what any specific process or system is doing, what it is consuming or emitting, what the impact per unit process output is, what is the efficiency of conversion of resources into product, what it the efficiency of the cycle, how does one system or process compare to another doing the same thing, and how does the overall performance match up with competitors in the same market, company, division, or factory, and so on. The upshot of the discussion is that it should be possible to close gaps between what is needed to understand the items above and what is available. Further, the idea is to leverage the capabilities of big data and the digital views of an enterprise to help close this gap. First, it is helpful to try to understand what big data and digital enterprises actually mean and then how they relate to our conversation here. A web search for the term “digital enterprise” turns up a lot of product pitches and some useful definitions. For example, WhatIs?TechTarget has a posting which offers the following definition - “A digital enterprise is an organization that uses technology as a competitive advantage in its internal and external operations.” The “technology” is referring to information technology. This is rather broad. Let’s take a look backwards to see what can be learned. In November 1994 Fortune magazine published an article by Gene Belinsky titled “The Digital Factory.” This turned up the other day when I was rummaging through some old files in my office. The article predicts a range of impacts that the digital factory will have from customization of products “literally in quantities of one while churning them out at mass production speeds” to allowing supply chain integration, micro factories and breathing new life into the “beleaguered U.S. machine-tool industry.” Referring to it as “soft manufacturing” it even proposed that the most astounding effect could be on employment where it “could stabilize or even increase the number of production-worker jobs in the U.S.” The article gives a number of excellent examples where this is being employed circa 1994 and the improvements realized and highlighting that “software is becoming more important than hardware - more important than machine tools - in American factories. And smart humans are back, replacing dumb robots.” It even predicted the importance of 3-D printing for prototyping. Well, the first part is right … software became more important than machine tools - in the U.S. at least. 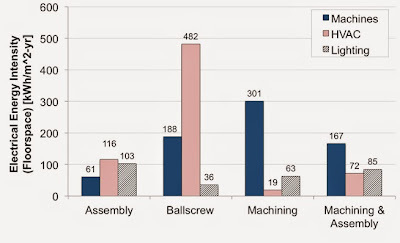 Since this report the U.S. machine tool industry has essentially collapsed and in its place are builders from Japan and Germany with machines of incredible sophistication. They figured out that software AND the machine tool was a powerful combination. We didn’t. The second part is not. Robots staged a comeback, thanks to capable planning software, better cheaper sensors and efficient motors and controllers combined with a better understanding of where they work best and with what tooling systems. Pick up any trade magazine or “Google” robots and you’ll see an amazing array of co-worker robots doing sophisticated tasks. And productivity in the U.S. is up (see the post in July 2013) but manufacturing employment has not keep up with growth. Is this current buzz about digital manufacturing just another Fortune 1994 article that, 20 years later, will look equally out of touch? Not likely. The downfall of the last prediction was that as software was growing in importance and capability, the “network” (or what was then connecting things) was infantile compared to what we now enjoy. Ditto for data flow from machines and systems. Sensors on production machinery (not just the position feedback data for machine tool axes or robot arm positions) were expensive, intrusive, slow to respond and often measured things that did not truly reflect the process or element being observed. One could go on at length about this but we’d be way off the path. Not so now. The examples cited in an earlier posting on the internet of things showed systems communicating an impressive volume of data at high rates - enabling essentially real time behavior and response. The companies that make machinery that link into these systems (the folks that picked up where most U.S. machine builders stopped) learned how to employ the better cheaper sensors and efficient motors and controllers combined with a better understanding of where they work best and with what tooling systems that made robots more pervasive. So, where does that leave us with respect to greening manufacturing and sustainable production? One is “measure digital value not digital interactions.” This is the digital interactions are “digital-washing” equivalent to "green washing." Results or progress against a benchmark or a fiducial is what counts. But first you need the yardstick. Another is “don’t accept historical norms; question the status quo; create a plan covering every function, product, business unit and location.” This is none other than the “Google earth view” of manufacturing identifying the elements, interfaces and value at all levels - leave no stone unturned. And, more over, it is looking for effectiveness and not only efficiency. Doing the suboptimal or wrong thing well is not a substitute for doing the correct thing and doing it well (some of this was covered in earlier postings). The last one to note (and please do read the whole article at the link above to get the full story) is “follow the money.” This addresses the “reduced impact for higher value” that has been trumpeted in this blog for some time. But, too often, follow the money is replaced by “follow the energy” and ignores other important consumables - materials, time, water, even labor. Energy is important for sure but many other econsumables are important too - maybe more important in some situations! The report states “Many organizations focus their digital investments on customer-facing solutions. But they can extract just as much value, if not more, from investing in back-office functions that drive operational efficiencies. A digital transformation is more than just finding new revenue streams; it’s also about creating value by reducing the costs of doing business.” Wow. We can use that. Do a “search and replace” here for digital investment, back office functions and finding new revenue streams replace them with sustainability initiatives, manufacturing processes and systems and reducing utility bills, respectively. And insert “environmental” between “costs” and “of” in the last line. Or … following all the substitutions it looks like this. Many organizations focus their sustainability initiatives on customer-facing solutions. But they can extract just as much value, if not more, from investing in manufacturing processes and systems that drive operational efficiencies. A digital transformation is more than just reducing utility bills; it’s also about creating value by reducing the costs of doing business. And, digital enterprises should be able to do this better and insure measurable progress. But there is also a “customer-facing” aspect to this of course. That’s where the circular economy comes in. Every enterprise has customers and is a customer to some other enterprise. That’s what’s shown in the Ricoh Comet Circle and, more abstractly, in the circular economy. It is necessary to explore this with a circular economy in mind … starting with how to inform the customers our enterprise serves as well as those to whom we appear as the customer. And this has to be done both external to the organization as well as inside. We’ll continue with this in the next posting.